Municipal solid waste (MSW) combustor ash is the by-product that is produced during the combustion of municipal solid waste in solid waste combustor facilities. In most modern mass burn solid waste combustors, several individual ash streams are produced. They include grate ash, siftings, boiler ash, scrubber ash and precipitator or baghouse ash. Figure 1 presents a cross-section of a modern mass burn waste combustor with energy recovery, showing where each of the ash streams is produced. At the present time in the United States, typically all of the ash streams are combined. This combined stream is referred to as combined ash. The term bottom ash is commonly used to refer to the grate ash, siftings and, in some cases, the boiler ash stream. The term fly ash is also used and refers to the ash collected in the air pollution control system, which includes the scrubber ash and precipitator or baghouse ash. In Europe, most facilities separate and separately manage the bottom ash and fly ash streams. Approximately 90 percent of the bottom ash stream consists of grate ash, which is the ash fraction that remains on the stoker or grate at the completion of the combustion cycle. It is similar in appearance to a porous, grayish, silty sand with gravel, and contains small amounts of unburnt organic material and chunks of metal. The grate ash stream consists primarily of glass, ceramics, ferrous and nonferrous metals, and minerals. It comprises approximately 75 to 80 percent of the total combined ash stream. Boiler ash, scrubber ash, and precipitator or baghouse ash consist of particulates that originate in the primary combustion zone area and are subsequently entrained in the combustion gas stream and carried into the boiler and air pollution control system. As the combustion gas passes through the boiler, scrubber, and precipitator or baghouse, the entrained particulates stick to the boiler tubes and walls (i.e., boiler ash) or are collected in the air pollution control equipment (i.e., fly ash), which consists of the scrubber, electrostatic precipitator, or baghouse. Ash extracted from the combustion gas consists of very fine particles, with a significant fraction measuring less than 0.1 mm (No. 140 sieve) in diameter. The baghouse or precipitator ash comprises approximately 10 to 15 percent of the total combined ash stream. There are two basic types of solid waste combustors in operation in the United States today - mass burn facilities and refuse derived-fuel (RDF) facilities. Mass burn facilities manage over 90 percent of the solid waste that is combusted in the United States. Mass burn facilities are designed to handle unsorted solid waste, whereas RDF facilities are designed to handle preprocessed trash. The as produced RDF facilities, where the incoming municipal solid waste stream is shredded and presorted to remove ferrous metal and in certain cases nonferrous metal prior to combustion, can be expected to have different physical and chemical properties from ash generated at mass burn facilities. There are also significant differences between ash generated at modern waste-to-energy facilities and that generated at older facilities. Newer facilities, with improved furnace designs, generally achieve better burnout and have reduced organic content in the ash product. Due to air pollution control requirements in newer facilities, lime or a lime-based reagent is introduced into the pollution control system to scrub out acid gases from the combustion gas stream. This produces a fly ash that contains both reacted and unreacted lime. Older facilities without acid gas scrubbing do not have lime in their fly ash. Finally, newer facilities with improved air pollution control equipment (e.g., baghouses) are better able to capture the finer particulate materials and trace contaminants, which many of the older facilities usually release into the air. It also is likely that, in the future, more stringent air pollution control requirements (e.g., mercury and NOx control) will further alter both the physical and chemical properties of fly ash streams. At the present time most operating facilities in the United States recover the ferrous metal fraction present in MSW combustor ash, which can comprise up to 15 percent of the total ash fraction. Only a very small fraction (less than 5 percent) of the nonferrous fraction of the ash generated in the United States is recovered and utilized. Most of the ash is used as a landfill cover material. There is some commercial use of ash in road paving applications presently ongoing in Tennessee. In the United States and Japan, numerous studies in recent years have focused on the potential for using processed bottom ash and combined ash as an aggregate substitute in asphalt concrete, Portland cement concrete, and as an aggregate in stabilized base applications. Although neither federal nor most state regulations categorically restrict the use of MSW combustor ash (as long as the ash is determined to be nonhazardous in accordance with regulatory testing criteria), the presence of trace metals, such as lead and cadmium, in MSW combustor ash, and concern over leaching of these metals, as well as the presence of dioxins and furans in selected ash fractions (fly ash), has led many regulatory agencies to take a cautious approach in approving the use of MSW combustor ash as a substitute aggregate material. At the present time in the United States almost all of the annual 8 million metric tons (9 million tons) of ash produced is landfilled. This is in sharp contrast to the aforementioned European practice. MSW combustor ash is generally managed by the waste-to-energy facility operator on behalf of the local municipality or authority that owns the facility. The final disposition of ash is usually the responsibility of the municipality or authority. As a result, ash for recycling purposes could normally be obtained by contacting the municipality or authority responsible for the facility. The properties of the ash that may be made available for market will depend on the ash stream (e.g., combined, bottom or grate ash) that is proposed for use. In most cases combined ash contains excess unreacted lime that has been added as an acid gas treatment reagent and as a treatment additive to reduce the leachability of trace metals that are present in the residue. Combined ash, which contains the air pollution control system residues, typically has higher concentrations of volatile metals (e.g., lead, cadmium, zinc) than bottom ash. Bottom ash is usually lime free and contains fewer fines. It is the preferred material for recycling in Europe where the boiler ash is also segregated from the bottom ash prior to bottom ash use. In addition to the type of ash, the quality of ash received from a given facility will depend in great part on the processing equipment at the facility. A wide range of processing systems have been used to produce an ash-aggregate material from unprocessed residue. The most basic process consists of ferrous metal removal followed by screening of the residue, generally to a minus 19 mm (3/4 in) material, to create a sandy, granular product. Many waste combustors are presently incorporating not only ferrous removal equipment, but nonferrous removal to recover valuable aluminum and copper from the residue. Ferrous and nonferrous metal removal, screening and, in some cases, air classification can assist in producing a sandlike, metal-free, low organic content product. To reduce the fines content of combustor residues, pelletizing processes using Portland cement as a binding agent have been proposed and applied(4, 5) to improve the engineering and environmental characteristics of incinerator ash. (6) Vitrification, which is a high-temperature process designed to melt and subsequently cool the ash, has been proposed as a potential processing strategy. There are a number of commercial-sized ash vitrification systems currently in operation in Japan. (7) The high cost of vitrification, due primarily to the energy and facilities required to heat and melt the ash, tends to discourage the use of this technology in the United States. Municipal waste combustor ash has been tested for use as an aggregate substitute in asphalt paving mixes, where it has performed in a satisfactory manner, particularly in base or binder course applications. In this application, the ash is used to replace the sand-size or fine aggregate portion of the mix. In most cases, processed ash that is screened to less than 19 mm (3/4 in) with ferrous and nonferrous metal removal can be introduced to replace anywhere from 10 to 25 percent of the natural aggregate normally present in the mix for surface course applications and up to 50 percent for base course applications. Municipal waste combustor ash (grate ash) has been used as a granular base in road construction, as a fill material, and as an embankment material in Europe for almost two decades. The use of ash in granular base and fill applications in the United States has been limited primarily to demonstrations. 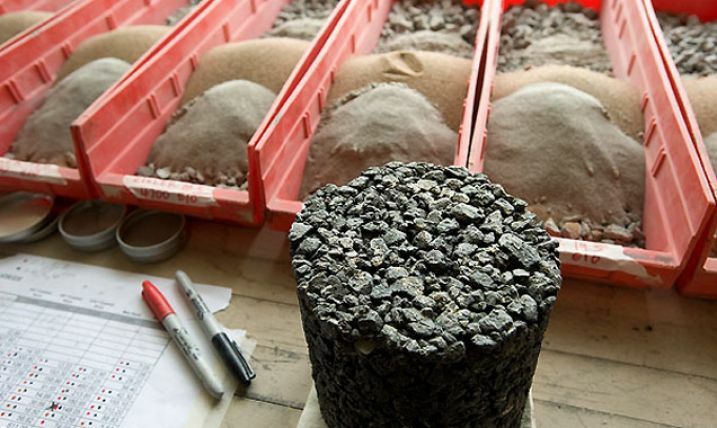 In granular base or embankment applications, properly processed ash (i.e., screened to less than 25 to 38 mm (1 to 1-1/2 in) and metal removed) can be either blended or used alone in these applications. Ash can also be stabilized with Portland cement or lime to produce a stabilized base material. Table 1 presents a list of data for some typical physical properties of municipal waste combustor combined and bottom ash that were obtained from two recent comprehensive investigations in which the physical properties of both bottom and combined ash were characterized. Table 1. Selected physical properties of municipal solid waste combustor ash. 1. Note: Higher 0.075 mm (No. 200) values were obtained in wash sieve tests. The data indicate that municipal solid waste combustor ash is a relatively lightweight material compared with natural sands and aggregate. The bulk specific gravities that were reported range from 1.5 to 2.2 for sand-size or fine particles and 1.9 to 2.4 for coarse particles, compared with approximately 2.6 to 2.8 for conventional aggregate materials. Combustor ash is highly absorptive with absorption values ranging from 5 to 17 percent for fine particles and from about 4 to 10 percent for coarse particles. Conventional aggregates typically exhibit absorption values of less than 2 percent. Prior to exiting a municipal solid waste combustor, the ash is quenched, resulting in the high moisture content values listed in Table 2. This high moisture content is due the quenching and relatively high porosity and absorptive nature of combustor ash. The relatively low unit weights further underscore the lightweight nature of combustor ash, and the loss on ignition values suggest that the ash can contain relatively high levels of organics compared with conventional aggregates. Combustor ash is primarily a sandy material with the major fraction passing a 4.75 mm (No. 4) sieve. Ash also contains a relatively high minus 0.075 mm (No. 200 sieve) silt fraction. Table 2 lists the major chemical constituents present in MSW combustor ash. Table 2. Typical chemical composition (percent). The most abundant elements in municipal waste combustor ash are silica, calcium, and iron. Although ash composition can be expected to vary from facility to facility, these elements are present within relatively predictable ranges. This is reflected in the results presented in Table 2. The presence of a relatively high salt content and trace metal concentrations, including such elements as lead, cadmium, and zinc, in municipal waste combustor ash (compared with conventional aggregate materials) has raised concerns in recent years regarding the environmental acceptability of using ash as an aggregate substitute material. The presence of calcium and other salts in relatively high concentrations in MSW combustor ash makes the ash susceptible to hydration and/or cementitious reactions (particularly in the combined ash, which contains unreacted lime) and subsequent swelling. The presence of free aluminum in the ash when combined with water can also result in the formation of hydrogen gas. In addition, the high salt content also suggests that ash could be corrosive if placed in contact with metal structures, and that it would likely interfere with curing and strength development if used in Portland cement concrete. Table 3 lists some typical mechanical properties associated with municipal waste combustor ash. The data suggest that MSW combustor ash has relatively poor durability characteristics as measured by the Los Angeles. Abrasion Test. Los Angeles abrasion values presented are above or at the limits normally specified for the use of coarse aggregates in asphalt paving applications. Reported soundness values are generally within typical specifications, suggesting that ash is not highly susceptible to freeze-thaw cycles. California Bearing Ratio (CBR) results for both bottom and combined ash are similar to those that could be anticipated for a well-graded crushed stone, suggesting excellent bearing capacity: reported friction angle data suggest a material with good lateral stability. Table 3. Typical mechanical properties of MSW combustor ash. U.S. Environmental Protection Agency. Characterization of Municipal Solid Waste in the United States: 1995 Update, EPA 5300-R-96-001, March 1996. Chesner, W. H. "Working Towards Beneficial Use of Waste Combustor Ash," Solid Waste and Power, Volume V11, No. 5, September/October, 1993. Chandler et al. An International Perspective on Characterisation and Management of Residues from Municipal Solid Waste Incineration. Summary Report, International Energy Agency, 1994. Downs, J. J. Rolite Treatment Optimization and Laboratory Analysis Data. Final Report, Rolite Inc., April 30, 1990. Hooper, W. "Processed Ash Demonstration Project," Proceedings of the Fourth International Conference on Municipal Solid Waste Combustor Ash Utilization. Arlington, Virginia, November, 1991. ASME. Vitrification of Residue (Ash) from Municipal Waste Combustion Systems. ASME/U.S. Bureau of Mines, CRTD-Vol. 24, 1995. Fujimoto, T., and E. Tanaka. "Melting Treatment for Incinerated Residue of Municipal Waste," Proceedings of the Pacific Basin Conference on Hazardous Waste. April, 1989. Collins, R. J., R. H. Miller et al. Technology for Use of Incinerator Residue as Highway Material. Federal Highway Administration, Report No. FHWA/RD-77/151, 1977. Haynes, J. and W.B. Ledbetter. Incinerator Residue in Bituminous Base Construction. Federal Highway Administration, Report No. FHWA-RD-76-12, Washington, DC, 1975. Pavlovich, R.D., H.J. Lentz and W.C. Ormsby. Installation of Incinerator Residue as Base-Course Paving Material in Washington, D.C. Federal Highway Administration, Report No. FHWA-RD-78-114, Washington, DC, 1977. Chesner, W. H., R. J. Collins, and T. Fung. "The Characterization of Incinerator Residue in the City of New York." Proceedings of the 1986 National Waste Processing Conference. ASME Solid Waste Processing Division, June, 1986. Koppelman, L. E. and E.G. Tanenbaum. The Potential for Beneficial Use of Waste-to-Energy Facility Ash: Volume 4, Engineering Properties. New York State Energy Research and Development Authority, July, 1993. Eighmy, T. T., D. L. Gress et al. The Laconia, New Hampshire Bottom Ash Paving Project: Volume 3, Physical Performance Testing Report. Environmental Research Group, University of New Hampshire, January, 1996. Demars, K. R., et al. "Municipal Waste Combustor Bottom Ash Road Paving and Structural Fill Demonstration Project - Connecticut Resources Recovery Authority’s Shelton Landfill, Shelton, Connecticut," Proceedings of the Sixth International Conference on Municipal Solid Waste Combustor Ash Utilization. Arlington, Virginia, November, 1993. Healy, K. A., Klei, and D.W. Sundstrom. Characteristics of Incinerator Residue and the Effect of its Leachate on Groundwater. Connecticut University, Storrs Institute of Water Resources, NTIS PB 288641, USEPA Office of Water Research and Technology, Washington, DC, September, 1978. Forrester, K. E. and R.W. Goodwin. "Engineering Management of MSW Ashes: Field Empirical Observations of Cement-Like Characteristics,"Proceedings of the International Waste Conference on Municipal Waste Combustion. U.S. Environmental Protection Agency and Environment Canada, Hollywood, Florida, April, 1989. Municipal solid waste (MSW) combustor bottom ash and combined ash that has been processed to remove ferrous and nonferrous metals and to achieve the appropriate particle size gradation can be blended with other aggregates for use in an asphalt paving mix. Due to the larger fraction of finer, grain-sized material in processed MSW combustor ash than coarse, grain-sized material, the ash is primarily used as a substitute for fine aggregate in a paving mix. Although up to 50 percent, by weight of aggregate, has been used in some test pavements, it is recommended that the substitution rated be limited to 25 percent ash in binder or base course and 15 percent or less in surface mixes to ensure satisfactory paving material production and field performance. There is no large-scale commercial use of municipal waste combustor ash in asphalt paving mixes in the United States at the present time. A listing of specific design details associated with many of the referenced test pavement demonstrations is presented in Table 10-4. All of the 1970 pavement demonstrations were considered successful by FHWA, with the exception of the Harrisburg pavement where considerable stripping was reported during the first year. In general, the results of the early FHWA test demonstrations suggested that municipal waste combustor ash could be mixed, placed, and compacted using conventional bituminous construction equipment. Base course applications were generally considered to be better suited for use as ash pavements than wearing coarse applications. Table 4. MSW combustor ash paving demonstrations. During the asphalt production process, the introduction of aggregates blended with a large fraction of ash (that contains a high moisture and fines content) could result in potential operational problems. This includes lower plant throughput rates to provide greater time for drying and potential clogging of the asphalt plant baghouse with excessive fines from the ash. Asphalt pavements incorporating municipal waste combustor ash can be expected to benefit from the low unit weight of the ash compared with conventional aggregate and the resultant higher yield expressed in terms of volume per ton. Pavements that contain higher percentages of ash require higher percentages of asphalt binder (cement) compared with conventional aggregate mixes. This results from the highly absorptive characteristics of ash particles. Due to the relatively low durability of ash particles compared with that of natural aggregates, and the high percentage (approximately 20 to 30 percent) of glass that is present in ash, the introduction of high percentages of ash into wearing course mixes could result in ravelling or stripping problems. The separation of the coarse ash particles (grate ash) from the fine ash particles (fly ash and the boiler ash) at the combustion facility, and the use of the coarse ash, is a preferable ash collection strategy. From a paving perspective the reduction in fines would help reduce the highly absorptive fine fraction and also help to alleviate potential baghouse clogging problems during the asphalt production process. Screening to a minus 19 mm (3/4 in) top size is necessary to produce an aggregate substitute material that can meet most gradation specifications. Screening to a smaller top size, such as minus 12.7 mm (1/2 in), is more desirable to produce a material with a lower plus 12.7 mm (1/2 in) fraction, since this fraction can consist of weak particles (clinkers) that readily break down during handling. Screening of ash with a relatively high moisture content to a minus 12.7 mm (1/2 in) size, however, could clog screening equipment or slow screening throughput rates. Ferrous removal using magnetic separators is mandatory, and nonferrous metal removal using eddy current separators is preferable to produce a metal-free nonreactive ash product. The presence and oxidation of ferrous metal in surface pavements could result in popouts. To satisfy the gradation requirements of AASHTO T27 (11) municipal waste combustor ash must be blended with conventional aggregate. High temperature melting processes that vitrify the ash have been commercially used in Japan and have been demonstrated in the United States(12,13) The process of vitrification can produce a glass product that can alleviate many of the aforementioned problems associated with ash fines and moisture. Such processing, however, is energy intensive and costly and has not been adopted in the United States. Some of the engineering properties of MSW combustor ash that are of particular interest when MSW combustor ash is used as aggregate in asphalt paving applications include gradation, unit weight, durability, moisture content, and absorption. Unit Weight: The lower unit weight of MSW combustor ash, which is approximately 965 to 1290 kg/m3 (60 to 80 lb/ft3), can be expected to result in higher asphalt paving yields (paved area per mass of asphalt), when compared with natural aggregate paving yields. Durability: MSW combustor ash exhibits marginal durability, as measured by the Los Angeles Abrasion test (40 to 50 percent). Breakdown of coarse particles can be expected in handling and asphalt production, which could potentially reduce the quality of the mix. Moisture Content: MSW combustor ash moisture content can vary a great deal, ranging from approximately 30 to 60 percent on a dry weight basis. This moisture content, as previously noted, can be expected to impact asphalt production operations. Absorption: MSW combustor ash is a highly absorptive material, with absorption values ranging from 5 to 17 percent. This manifests itself in asphalt cement requirements that could be significantly higher (10 to 20 percent) than that required when conventional aggregate materials are used. Some of the asphalt mix properties that can be affected by the use of MSW combustor ash include mix stability and stripping (moisture susceptibility). Stability: Stability of mixes has been reported to be comparable to natural aggregate mixes. (9) These results are expected if municipal waste combustor ash is used to replace primarily the fine aggregate fraction of the mixes. Stripping: During demonstration programs in the 1970's, hydrated lime was added to MSW combustor ash as an antistripping agent in surface courses. During demonstrations in the late 1980's and 1990's, no hydrated lime was added. When ash is used as a fine aggregate substitute and mix percentages are kept low (approximately 15 percent), stripping problems should be minimal. Higher percentages may warrant the addition of an antistripping agent. Lower ash contents may be more suitable in paving mixes to reduce the asphalt cement requirements resulting from the introduction of a large fraction of highly absorptive ash particles into the mix. (14) As long as percentages of ash introduced into a mix remain low (less than 20 percent), additional asphalt cement requirements should be reasonably low. Lower ash contents in surface mixes can also eliminate the need for antistripping agents such as hydrated lime. No special accommodation is required for aggregate gradations and conventional hot mix gradations can be used; however, it is advisable to anticipate some measurable breakdown of ash particles during handling. This could increase the fine aggregate and silt fraction of the mix during the production process and open up new, uncoated absorptive particles resulting in unanticipated asphalt demand. Conventional AASHTO pavement structural design methods are appropriate for asphalt pavements incorporating MSW combustor ash in the mix. In some European countries, where MSW combustor bottom ash is used as a granular base material, the ash is stored from 30 days to 6 months prior to use. (15) This storage period provides time for potentially hydratable and expansive salts to react prior to the use of the material in a construction application. The use of combined ash that may contain free lime could further aggravate this problem. Storage of ash for at least 30 days in asphalt paving applications is probably adequate when using 10 to 20 percent ash in the mix. Longer periods of storage may be needed if higher percentages of ash are introduced into a mix. The same methods and equipment used for conventional asphalt production are applicable to paving mixes containing MSW combustor ash. During asphalt production, special care must be provided to control plant temperature, which could be impacted by the moisture content of the ash. This will probably necessitate a reduction in plant throughput rates. Excessive fines in the ash and high ash contents (greater than 20 percent) could result in excessive carry-over of fines into the baghouse. This will be more problematic in batch plants where the ash will most likely be dried by itself prior to storage in hot bins. The same methods and equipment used for placing and compacting conventional pavement are applicable to asphalt pavements containing MSW combustor ash. 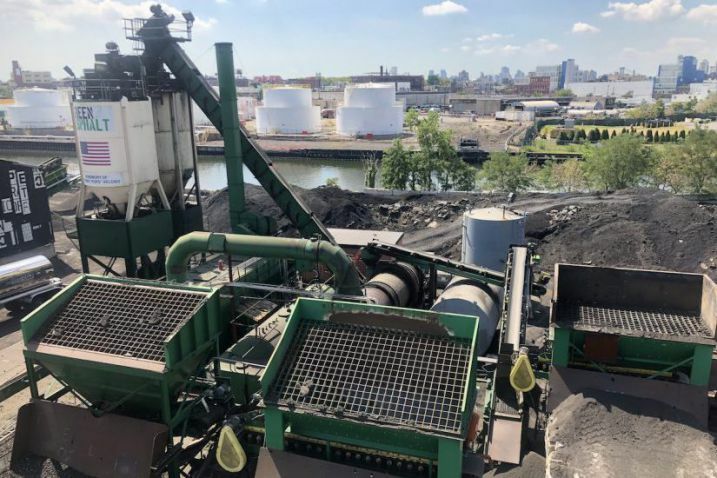 The use of municipal waste combustor ash in hot mix asphalt has yet to be commercialized on a large scale in the United States There are no specifications regarding minimum processing requirements, ash properties, or mix characteristics. In addition, ash contains levels of trace metals (particularly lead) and high soluble salt levels. Potential impacts need to be more fully addressed to ensure that the use of MSW combustor ash does not result in any adverse environmental impacts. Additional data regarding asphalt plant operations and air emission quality, when MSW combustor ash are introduced into a plant, is needed. Walter, C. Edward. "Practical Refuse Recycling," ASCE Journal of the Environmental Engineering Division, American Society of Civil Engineers, Volume 102, No. EE1, February, 1976, pp. 139-148. Haynes, J. and W. B. Ledbetter. Incinerator Residue in Bituminous Base Construction. Federal Highway Administration, Report No. FHWA-RD-76-12, Washington, DC, 1975. Pavlovich, R. D., H. J. Lentz and W. C. Ormsby. Installation of Incinerator Residue as Base-Course Paving Material in Washington, D.C.Federal Highway Administration, Report No. FHWA-RD-78-114, Washington, DC, 1977. Collins, Robert J., Richard H. Miller and Stanley K. Ciesielski. Guidelines for Use of Incinerator Residue as Highway Material, Federal Highway Administration, Report No. FHWA-RD-77-150, Washington, DC, 1977. Ormsby, W. C. "Paving with Municipal Incinerator Residue," Proceedings of the First International Conference on Municipal Solid Waste Combustor Ash Utilization. Philadelphia, Pennsylvania, October, 1988. Demars, K. R. et al. "Municipal Waste Combustor Bottom Ash Road Paving and Structural Fill Demonstration Project, Connecticut Resources Recovery Authority's Shelton Landfill," Proceedings of the Sixth International Conference on Municipal Solid Waste Combustor Ash Utilization.Arlington, Virginia, November, 1993. Hooper, William F. "Processed Ash Demonstration Project," Proceedings of the Fourth International Conference on Municipal Solid Waste Combustor Ash Utilization. Arlington, Virginia, November, 1991. McBath, Paula J. and Patrick F. Mahoney. "The Road to Beneficial Reuse of SEMASS Boiler Aggregate™," Proceedings of the Sixth International Conference on Municipal Solid Waste Combustor Ash Utilization. Arlington, Virginia, November, 1993. Eighmy, T. Taylor and David L. Gress. The Laconia, N.H. Bottom Ash Paving Project: Volume 3, Physical Performance Testing Report. Environmental Research Group, University of New Hampshire, Durham, New Hampshire, January, 1996. Chesner Engineering, P.C. On-Site Center Drive Demonstration Monitoring Plan, Port Authority of New York and New Jersey, November, 1995. American Association of State Highway and Transportation Officials. Standard Method of Test, "Sieve Analysis of Fine and Coarse Aggregates," AASHTO Designation: T27-84, Part II Tests, 14th Edition, 1986. Fujimoto, T. and E. Tanaka "Melting Treatment for Incinerated Residue of Municipal Waste," Proceedings of the Pacific Basin Conference on Hazardous Waste. April, 1989. Chesner, W. H., R. J. Collins, and T. Fung. "The Characterization of Incinerator Residue in the City of New York," Proceedings of the 1986 National Waste Processing Conference. ASME Solid Waste Processing Division, June, 1986. Chandler et al. An International Perspective on Characterisation and Management of Residues from Municipal Solid Waste Incinerators.Summary Report, International Energy Agency, 1994. American Society for Testing and Materials. Standard Specification D2726-96, "Bulk Specific Gravity and Density of non-Absorptive Compacted Bituminous Mixtures," Annual ASTM Book of Standards, Volume 04.03, ASTM, West Conshohocken, Pennsylvania, 1996. American Society for Testing and Materials. Standard Specification D2950-96, "Density of Bituminous Concrete in Place by Nuclear Methods,"Annual ASTM Book of Standards, Volume 04.03, ASTM, West Conshohocken, Pennsylvania, 1996. Municipal solid waste (MSW) combustor ash (bottom ash or combined ash) can be used as a granular base material in road construction applications. The high stability of MSW combustor ash provides for good load transfer to the pavement subgrade. Its somewhat marginal durability, however, could result in breakdown during compaction and the relatively high percentage of fines in combustor ash could result in frost susceptibility. The ash must also be stored prior to use to minimize the possibility of any volumetrically expansive hydration reactions from occurring after placement. In the United States test demonstrations have been undertaken in Texas, Massachusetts, and California. (2) In addition to its use as a granular base, municipal waste combustor ash has also been blended with lime and used or proposed for use as a stabilized base material. (3) A listing of some locations where MSW combustor has been used in road base applications is presented in Table 5. Although there has been little documented postconstruction monitoring on any of the test demonstrations, all of the demonstrations are believed to have performed in a satisfactory manner. Some of the more desirable features of MSW combustor ash in granular base applications include its extremely high stability and low unit weight. It is not a highly durable material, however, and is subject to particle size breakdown under heavy equipment load. MSW combustor ash also contains concentrations of trace metals and soluble salts that may warrant some environmental concern. Table 5. MSW combustor ash road base/subbase demonstrations. In most countries in Europe where ash has been used as a granular base material, the grate ash has been separated from the boiler ash and fly ash. This helps to reduce the fines (minus 0.075 mm (No. 200 sieve)) fraction from the ash, producing a more suitable granular base material. It also eliminates the inclusion of free lime associated with the fly ash fraction, which could produce expansive reactions, and provides for a material with lower trace metal and trace organic content than the combined ash stream. Ferrous and nonferrous metal should be removed prior to use. Metal removal is necessary to produce a suitable granular material, because ferrous and some nonferrous metals (such as aluminum) are known to produce adverse reactions. For example, free aluminum that is present in the ash could potentially react with water to form hydrogen gas. The organic content in the ash should be minimized. In some countries bottom ash samples found to contain greater than 5 percent LOI are unacceptable for use. The organic limitations are primarily the result of concern over gas evolution and subsidence problems. (1) These organic content limitations can normally be met if the combustor is operating efficiently. If the organic content is higher, then additional processing, such as air classification, may be required. Screening In some European countries it is recommended that the ash be screened to a maximum grain size of 50 mm (2 in), with less than 10 percent of the total weight less than 0.06 mm (No. 300 sieve) in size. (1) Aging It is recommended that bottom ash should be stockpiled for a 1- to 3-month period to allow swelling, hydration, carbonation, and oxidation aging reactions to occur. Structural design procedures for granular base containing processed MSW combustor ash are the same as design procedures for bases containing conventional aggregate. Combined ash with excess lime can be expected to exhibit properties similar to that of a lime-stabilized base material. In such cases AASHTO T99(10) or T180(11) procedures should be used to prepare a mixture with optimum moisture and maximum compacted density. ASTM C593(12) compressive strength and durability testing should be undertaken to assess the properties of the compacted mix. The most pressing issue to be resolved relative to the use of incinerator ash in granular base applications is the environmental suitability of using these materials. Although no adverse impacts associated with using these materials in Europe have been reported, the high trace metal and salt contents associated with these residues have raised concerns regarding the environmental suitability of these materials. Additional work is also needed to address aging requirements and the potential for hydrogen gas formation due to free metal and water reactions. Chandler, et al. An International Perspective on Characterisation and Management of Residues from Municipal Solid Waste Incineration.Summary Report, International Energy Agency, 1994. Chesner, W. H. "Working Towards Beneficial Use of Waste Combustor Ash," Solid Waste and Power, Volume VII, No. 5, September/October, 1993. Gnaedinger, J. P. Lime Treatment of Incinerator Residue for Road Base Construction, FHWA, DOT-FH-11-8128, September, 1978. American Association of State Highway and Transportation Officials. Standard Specification for Materials, "Aggregate and Soil-Aggregate Subbase, Base and Surface Courses," AASHTO Designation: M147-70 (1980), Part I Specifications, 14th Edition, 1986. Koppelman, L. E. and E. G. Tanenbaum. The Potential for Beneficial Use of Waste-to-Energy Facility Ash: Volume 4, Engineering Properties.New York State Energy Research and Development Authority, July, 1993. Eighmy, T. T., D. L. Gress et al. The Laconia, New Hampshire Bottom Ash Paving Project: Volume 3, Physical Performance Testing Report.Environmental Research Group, University of New Hampshire, January, 1996. Demars, K. R. et al. "Municipal Waste Combustor Bottom Ash Road Paving and Structural Fill Demonstration Project - Connecticut Resources Recovery Authority's Shelton Landfill, Shelton, Connecticut," Proceedings of the Sixth International Conference on Municipal Solid Waste Combustor Ash Utilization. Arlington, Virginia, November, 1993. Healy, K., A. Klei, and D.W. Sundstrom. Characteristics of Incinerator Residue and the Effect of its Leachate on Groundwater. Connecticut University, Storrs Institute of Water Resources, NTIS PB 288641, USEPA Office of Water Research and Technology, Washington, DC, September, 1978. Forrester, K. E. and R.W. Goodwin. "Engineering Management of MSW Ashes: Field Empirical Observations of Cement-Like Characteristics," Proceedings of the International Waste Conference on Municipal Waste Combustion. U.S. Environmental Protection Agency and Environment Canada, Hollywood, Florida, April, 1989. American Association of State Highway and Transportation Officials. Standard Specification for Materials, "Moisture-Density Relationship Using a 5.5 lb Hammer and a 12-Inch Drop," AASHTO Designation: T-99 (1980), Part I Specifications, 14th Edition, 1986. American Association of State Highway and Transportation Officials. Standard Specification for Materials, "Moisture-Density Relationship Using a 10 lb Hammer and an 18-Inch Drop," AASHTO Designation: T180 (1980), Part I Specifications, 14th Edition, 1986. ASTM C593. "Standard Specification for Fly Ash and Other Pozzolans for Use with Lime," American Society for Testing and Materials, Annual Book of ASTM Standards, Volume 04.01, ASTM, West Conshohocken, Pennsylvania, 1996. Hartlen, J. and J. Rogbeck. "Sorted Incinerator Slag Used as Fill Material," Proceedings of the International Conference on Municipal Waste Combustion. U.S. Environmental Protection Agency and Environment Canada, Hollywood, Florida, April, 1989.